Are you having a party sometime soon? Why not try something different this time? Steer clear of the usual chips and dip. Offer your guests something completely different from the average parties that they’re used to. 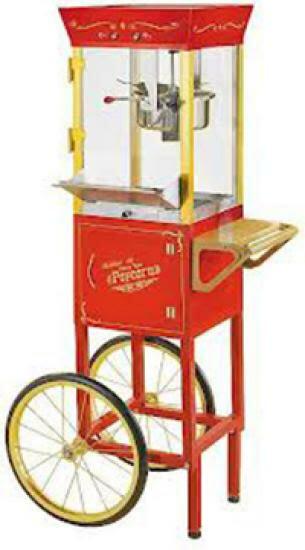 Try out our fresh Popcorn Machine. This isn’t just some store-bought popcorn. It’s not the kind that pops up in a microwave oven, either. This is the REAL deal - cooked in a popcorn machine, just like at the cinema. You can feel a sense of nostalgia float over you, too. Go back to the simpler times when parties were about good food and refreshments, where people actually socialised with each other. You can make all of this possible, and you can start out by hiring this simple machine. Take your party experience a level further. We offer an “unsupervised” option for our machines, which means that you can take over the popcorn machine: you can cook the corn yourself and dish it out to waiting guests. Your guests can try cooking the popcorn themselves, too - which can be quite a fun new experience for everyone! However, if you feel like you already have too much hosting responsibilities on your shoulders, we’ll gladly do the job for you - take our “supervised” option and the machine will arrive at your premises with an assigned operator. Aside from popcorn, we also offer other party favors, such as candy floss machines. Inflatable castles, domes, assault courses, and slides are more things that you’ll find in our selection. Complete your party with our wide variety of games for kids and grown ups alike. Think of us for your next event. Feel free to contact us for whatever it is that your party needs. You can also give us a call, or email us with concerns and inquiries.